Stella Maris Catholic Church had its beginnings in a collaborative master plan process. The objective was to explore future possibilities for the parish’s land and its former church in central Maroochydore. Deicke Richards worked initially with Stella Maris and later with both the parish and aged care provider, St Vincent’s Care Services. The result is an innovative care community which brings together the new church and aged care and wellness facilities. 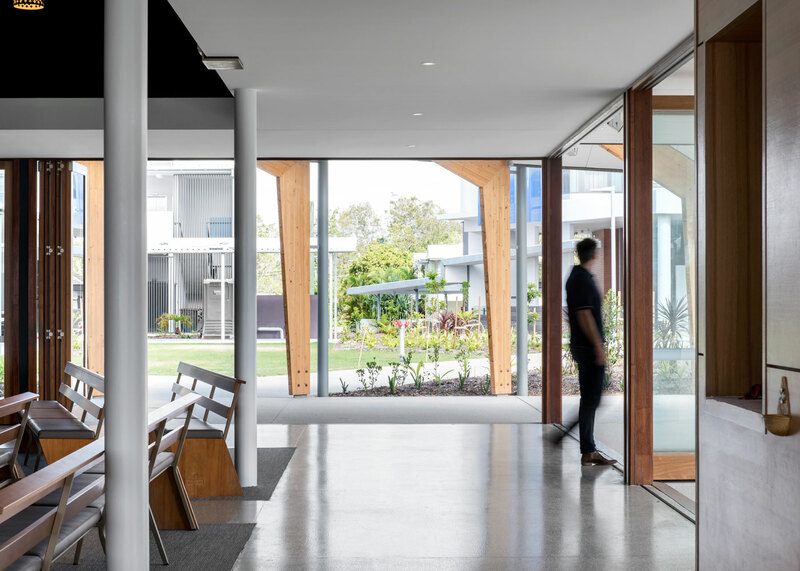 This serves as a great example, in a regional city, of the possibilities for co-location of aged care with existing or new community facilities. 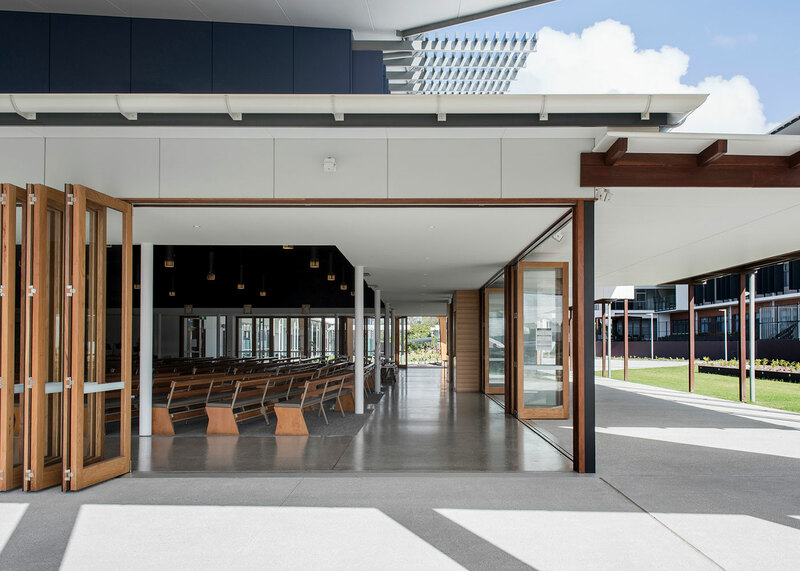 The design of the church responds expressively to its subtropical coastal location, with the interior skirted by generous and deeply shaded space. Marble and brass sanctuary items are set against an interior palette of polished concrete, ply and timber. The interior’s furniture, lighting, screens and sanctuary items were designed by Deicke Richards. The design team worked with artisans and artists who created the hand painted icons and refurbished stations of the cross, locally produced pews (using reclaimed timber from the former church pews) and the cross (carved from a mango tree grown on the site). The sanctuary items were cut from Italian marble and finished by locally based stonemasons. Maroochydore is no ordinary parish and this is no ordinary church’, Archbishop of Brisbane, The Most Reverend Mark Coleridge, speaking at the church’s Solemn Dedication. The services provided were comprehensive, from the master planning process and options for development, through to architectural design and interiors. The project involved locally based professional services practices, trades and artisans. The completed project is a public building with an important community function. 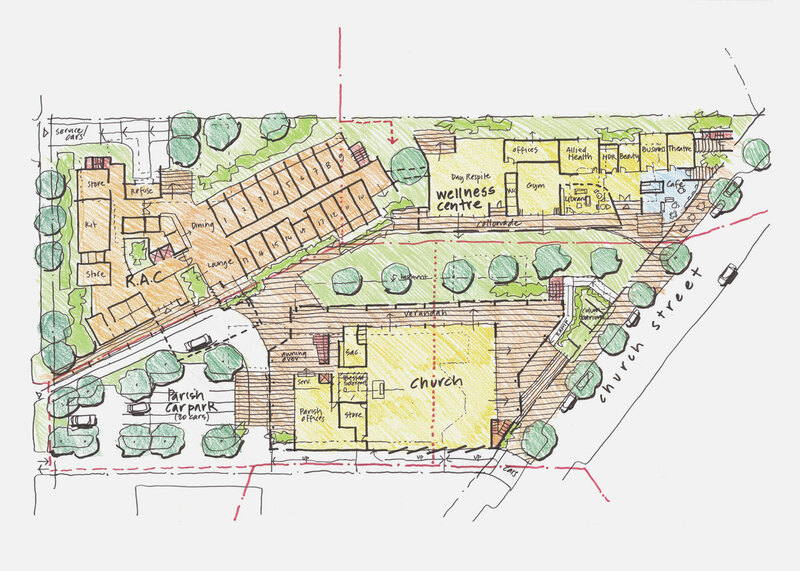 In this case, the church sits at the heart of a development where parish facilities are co-located with a new aged care facility. It’s a great example, in a regional city, of the possibilities for co-location of aged care with existing or new community facilities. The outcomes are not only better use of land, but greater outcomes in terms of community, amenity and social cohesion.